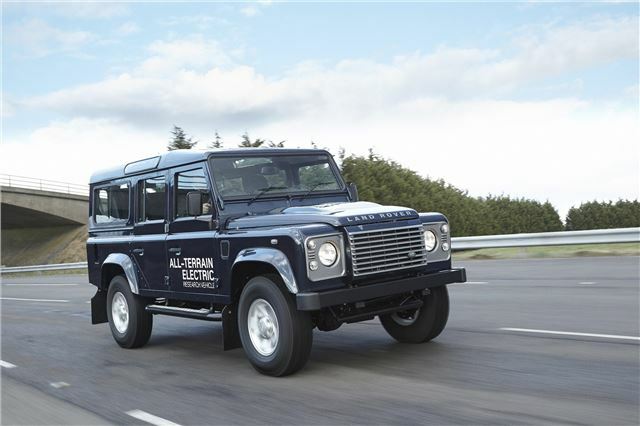 Land Rover is unveiling seven new electric Defender models at the 2013 Geneva Motor Show. The research vehicle's standard diesel engine and gearbox have been replaced by a 70kW (94bhp), 330Nm electric motor twinned with a 300-volt, lithium-ion battery with a capacity of 27kWh, giving a claimed range of more than 50 miles. The concept car's transmission is comprised of a single speed, 2.7:1 reduction gearbox combined with the existing Defender four-wheel drive system. A modified version of Land Rover’s Terrain ResponseSystem is also fitted. The vehicles were developed by Land Rover’s Advanced Engineering Team following successful trials of the Defender-based electric vehicle, Leopard 1. And they have already been extensively tested - trials included pulling a 12-tonne ‘road train’ up a 13 percent gradient and wading to a depth of 800mm. Land Rover says that there are currently no plans for production, but the electric Defender's suitability as a hard-core off-roader, and the sheer amount of testing that's been undertaken with this car would suggest that it's a little more than a rolling test-bed. Expect this technology to roll-out and appear in your showroom within the next few years.